Sometimes, listening to music takes you other places. Some are associated with certain people or events, and most recall an era, if not a specific moment, of your life. For example, listening to the Beatles' "White Album," I can't help but remember my Dad asking me whether I liked various artists while I canvased the record bins. After he bought me the record (on white vinyl even), I figured out that he was just reading names off of posters on the wall. Not quite so hip as I thought. Pink Floyd's "The Wall" is another. I remember my high school English teacher asking another student how he might describe it. His answer was "music to get stoned to." I always took exception to that, as the work itself was outstanding without outside influence. Regardless of age, it's interesting how fans of certain artists get stereotyped by the type of music played. 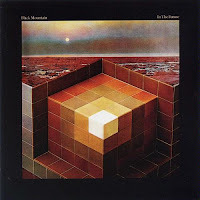 Black Mountain's "In the Future" is considered "modern heavy psychedelic rock." What that means is that they explored the styles of Jefferson Airplane, Iron Buttefly, Vanilla Fudge, Deep Purple, Tangerine Dream and other late 60's/early 70's bands. Music to get stoned to. Their music is heavy laden with keyboard and organ sounds, and perhaps they're notable for using a Mellotron - likely a more recent version as the originals tended to break - as they are rarely in use today. An electric guitar helps break up the potential repetitiveness of the keys. This Canadian band shows they can use most of the elements of the old groups, but they haven't put it all together effectively yet. Lyrically, there's vague mention of angels, evil, demons, storms, shadows and similar that fit with "heavy" music. There's aspects of hope as well, but it's all symbolism without context. It doesn't really matter, though. Despite nice vocals at times, it's the music that carries the effort. I never tried "drugs." This didn't result from parental warnings, but observations of my preceding generation and a fairly certain fear that I may actually like them. I attended a King Crimson concert at Meriweather Post Pavillion when I was in college (road trip!). One friend that went with me, Dr. Chicken, as he was called, was deep into music and generally unconventional. Someone looking at him and knowing his musical tastes would probably thing he was a drug user, but his idea of a stiff drink was orange juice, and he's also one of the nicest and most authentic people I've ever met. We arrived at the concert quite early and were seated in the lawn area. A guy came up and offered us "hits" if we needed them. Aside from likely being a fairly conspicuous undercover cop, this could have been one of those crucial moments where peer pressure results in a bad decision. Dr. Chicken's reply: "No thanks, man. This is a show I've got to see straight." Nicely done. So, between the Beatles' "White Album", "The Wall," and Dr. Chicken, kudos for taking me back. Drugs aren't required to enjoy this CD, either. The album's centerpiece is called "Black Lights," an overdone, overlong, anthemic, and repetitive song in which some teenagers are probably finding great meaning while under the influence. They should look elsewhere. "Stormy High" is decent, but probably the standout is "Wucan," whatever that means, but it's fully dressed in nostalgia. Suggested Tracks: "Stormy High," "Wucan," "Evil Ways"
Oh! They sound good. I would call it "music to meditate to". I will have to listen to some more!